From here, valuable information useful for those who are about to travel with children with Wizz Air. The rules set out below are to be considered valid for flights with the Magyar company. The latter, defines NEONATI, passengers from 14 days to 23 months of life. From the two years completed, up to 16, however, are considered CHILDREN. Infants travel in the arms of an adult. Newborns, travel for free. the special NEWBORN SUPPLEMENT is applied, which varies from a minimum of 8, to a maximum of € 27 each way. From the 2 years completed, the children will have to buy a normal adult fare ticket, and occupy their own seat. In this case it is possible to bring a seat for free. By subscribing to the exclusive Club of the Company, you can take advantage of important discounts. The reductions are particularly advantageous for all those who decide to travel with children with Wizz Air. The subscription to the FAMILY CLUB, at the cost of 60 € per year, allows you to get 10 € discount on the price of each ticket and 5 € on the baggage. Just make two simple accounts to understand that, by traveling in three, from the first round-trip flight, savings are guaranteed! You can check in online even if you are traveling with your children with Wizz Air. Times and procedure are the same as that of adults. Traveling with children under the age of 2, you will receive free priority boarding. Check-in at the airport is not recommended, as it has additional costs. If indicated, you will be assigned seats automatically, possibly near. For each row, there can be a maximum of one newborn. All children under the age of 14 can not travel alone. They must be accompanied by an adult over the age of 16. Children with Wizz Air, over the age of 2, and babies with a seat, may carry one piece of hand baggage of the same weight and size as an adult. In addition, they CAN CARRY a car seat for free, equipped with a device that allows it to be installed securely to the passenger seat belt. The adult accompanying a NEONATO can carry an additional hand baggage, the size of 40x30x18 cm. Travelers traveling with children with Wizz Air can bring a pram or a folding stroller for free. For small children you can carry one of these items for free. Inside the carry-on baggage, do not forget to bring the following items for your children: * Documents (card or passport, boarding pass, health card, visas, insurance policy). * First Aid Kit (Thermometer, patches, essential drugs). * Hygiene (diapers, wet wipes, handkerchiefs, cocoa butter, towel, cream). * Foods, possibly at the ideal temperature, stored in a thermos. Do not forget the snack for your little ones. * Toys, tablets, videogames, spare clothes. Baby food is allowed in the carry-on baggage, which is checked for baggage. There are no quantity limitations. 100 ml of boiled water can be brought on board, to be mixed with powdered milk. On board the plane, staff can heat bottles and food. Do not forget to take a look at our special section on Documents for Minors. 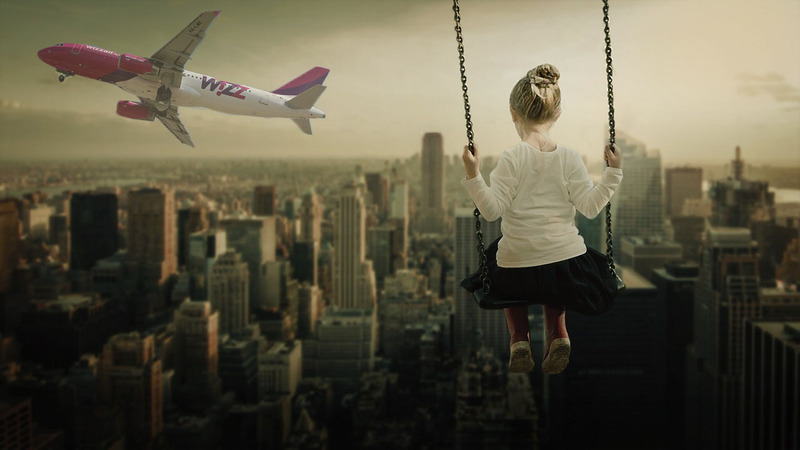 The best way to travel with children with Wizz Air, in complete tranquility.